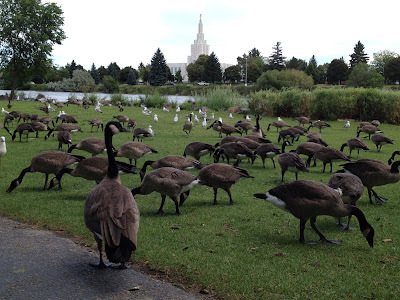 BizMojo Idaho: When it comes to Greenbelt geese, what about the 'Fido solution'? When it comes to Greenbelt geese, what about the 'Fido solution'? Geese and seagulls on the west bank of the Snake River in Idaho Falls. The city of Idaho Falls has decided it wants to manage the goose population on the Greenbelt. It has approved a $3,000, yearlong contract with USDA Wildlife Services that involves rounding up birds and relocating them to a management area, treating eggs so they don't hatch, and launching a don't-feed-the-birds education campaign. The City Council is scheduled to consider an ordinance at its July 25 meeting that could impose a fine for feeding wildlife -- not only geese, but seagulls, pigeons and ducks. One thing that hasn't been mentioned, however, is the "Fido Solution," more commonly called hazing. I give you this link from the Times Call of Longmont, Colo., from October 2012: Longmont wants dogs for 'goose hazing' on local golf courses. In the wild, foxes and coyotes are the natural predators of geese. Obviously we don't have an abundance of them in city limits, so the next best critters are obviously dogs. For a more detailed look at goose management methods, here is an interesting document I found this morning: Managing Problems Caused by Urban Canada Geese. The section on hazing says this: Geese are afraid of dogs, and they respond quickly when one is in their area. Any dog may be a satisfactory hazer although border collies are preferred because they are bred to herd sheep and are more relentless than other breeds in pursuing geese. However, dogs used for hazing must be supervised by a handler or tethered on a leash or a slip-wire. Some situations may allow the use of an “invisible fence” to restrict the dog. One potential drawback of using dogs to haze geese is that geese may swim out into the middle of the water and wait until the dog leaves. For hazing to be most effective, geese must be made to fly away. The most compelling paragraph in the report, however, was this one: Elimination of food handouts for urban geese is essential if geese are to be dissuaded from using a site. If people continue to feed geese on the property, the geese will be difficult to remove. I applaud the city for doing something about this. I hate the geese! They are messy and a nuisance pest. I wish I could mow down every single one of them with a machine gun, and punch everyone who feeds them (sorry I got a little violent there). I just want them gone.